For a while now it has seemed that my mother’s firmly held belief that she would recover from old age might have something to it. 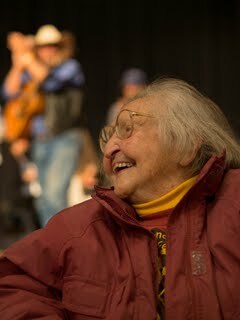 This upward swing came after a concert in her honor followed by a standing ovation from the folk music club of which she was chief protector, organizer and bottle washer for decades. Music and admiration: her elixir vitae. My earliest memories of my mother as a singer is the feel of coats. Rough, outdoor coats laid high on beds where I slept. Prickly, but wonderful to burrow under when tired of adults talking, in all senses, over my head. My mother took two things to parties in the early days: me and her guitar. I remember only one song from that time and that not for the music: Goodnight Irene by Leadbelly, blues guitarist extraordinaire. My mother knew Leadbelly in New York, was better friends with his wife and somehow mixed with the singing of his song was the story that Leadbelly’s wife taught my mother “you could lead any man in the world down the street when you had him by the balls.” I spent a great deal of time under the coats trying to form an image to match that piece of information. When I was older I sang some songs with my mother; I had taught myself to read music at the age of five and was told I was a good singer with natural harmony. When I was nine my mother replaced me. Nothing explained, not a word, just my babysitter was always asked to sing and not me. I never carried a tune after that, don’t sing and every instrument I touched put something in front of my mouth. When the folk music club began to meet at my mother’s house every other week, the relationship, as one might imagine, was somewhat strained. Not only did they treat our home as though it was a public amenity, but they were a reminder that I had been weighed and found wanting in what mattered to my mother most. There were still advantages: backstage passes at festivals, a few encounters with the famous. The one I remember best was Kris Kristofferson (newly coming to fame) and Ramblin Jack Elliot (friend and student of Woodie Guthrie, friend and teacher of Bob Dylan) spending the night because the toilet backed up and they were ones who unplugged it. It was only after my mother broke her hip last year that I began to see the club in its constituent parts, the help and affection for her from its members. And it was at this last concert, the one that pushed her uphill, that the outpouring finally touched me. The last song of the set was Carl Williams’s It’s a Pleasure to Know You which has been her signature farewell since she started letting go of parts of her old life. My mother is in a wheel chair at the front, someone is holding a mike for her, everyone in the room is standing and singing. Not just people from the club, but people who have been a part of my life: people I travelled in the circus with, people who supported me when I discovered I was pregnant, people who were there for me when my daughter was ill. And there are tears running down my face at the sweet sadness of my mother’s good bye. And I’m singing. This entry was posted in Going Home and tagged Carl Williams, daughter, Faith Petric, folk music, Free Folk Festival San Francisco, It's a Pleasure to Know YOU, Kris Kristofferson, Leadbelly, mother, Ramblin Jack Elliot. Bookmark the permalink. That’s just so moving, touching sad but also beautiful, Carole.